NEW YORK (CNNMoney.com) -- Investors snapped up shares of Tesla Motors public debut on Tuesday, which raised $266 million for the glitzy but not yet profitable electric car maker. Tesla, which began trading on Nasdaq under the symbol "TSLA (TSLA)," priced its shares late Monday at $17 each, above the target range of $14 to $16. When the shares hit the open market, the stock shot higher: Tesla's first trade on Nasdaq was for $19 a share. Tesla's Model S sedan is slated to go on sale in 2012. The stock immediately fell back below $18 to start the day, but soared as high as $25 before finishing the day at $24.64, up 45%. It was the first IPO by an American automaker since Ford Motor Co.'s debut in 1956. The offering tested investors' faith in a company that has proven it can make functional and stunning electric cars but has never had a profitable quarter. PayPal founder Elon Musk's seven-year old auto company lost $55.7 million last year and $260.7 million since its inception. The company has performed so poorly from a financial standpoint that Musk recently said he lost his entire personal fortune on Tesla. But investors were giddy about the Palo Alto, Calif.-based automaker's initial public offering, prompting Tesla on Monday to increase the number of shares it offered by nearly a fifth to 13.3 million. Much of the excitement is pegged to Tesla's launch of the Model S, an electric sedan that the company says will sell for a minimum of $50,000 in 2013. That's much more reasonable and practical for most consumers than the vehicle that Tesla currently sells, the $100,000 Roadster sports car. The electric automaker plans to acquire a plant where it will produce 20,000 new Model S sedans each year starting in 2013. That's a significant increase from the 1,063 Roadsters it has sold -- total. 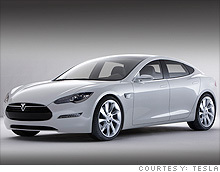 But until the Model S goes on sale, which will begin in 2012, Tesla said it will continue to pile up hefty losses. "Investors that are interested in Tesla know that it's going to continue to burn cash until it gets Model S into commercial production," said Matt Therian, an analyst at IPO research firm Renaissance Capital in Greenwich, Conn. "Tesla investors are really looking out to 2012, with their investment very much tied to whether they think 20,000 is a conservative or an aggressive number." There are many reasons to believe in Elon Musk & Co. Musk made his name -- and fortune -- on the success of electronic payment company PayPal, which was eventually acquired by eBay (EBAY, Fortune 500). And his space exploration technology company, SpaceX, earlier this month launched the first successful, privately funded spaceship with the capacity for human space transport. Tesla doesn't just have the backing of the successful Musk. Earlier this year, Tesla borrowed $465 million from the Department of Energy to fund production of the Model S.
Last month, Toyota (TM) announced that it will invest $50 million in Tesla and indicated that it would be interested in doing business with Tesla in the future. Tesla has also partnered with Daimler to develop an electric version of Daimler's tiny Smart cars. Still, some experts say that there are several reasons for investors thinking of buying Tesla's stock to precede with caution. By Tesla's own admission, the Model S has just one operable prototype, no final design or manufacturing process. The company also has not completed its purchase of the plant in which it plans to make the new car. As a result, Tesla's timetable for bringing the Model S to market may be a reach: After first being announced in September 2008, the company's plans to produce the Model S in 2012 is ambitious even for larger, established automakers. "Most experienced automakers race to put a car together in three years," said Angus MacKenzie, editor of Motor Trend magazine. 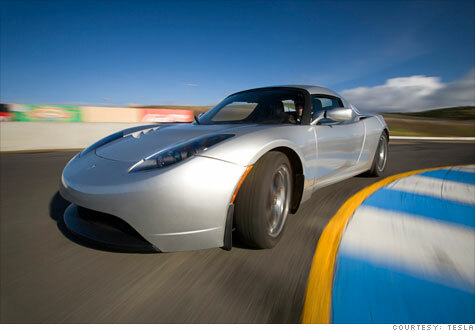 "I can't see Tesla making more than a handful of these -- if any -- in 2012." That's not good news, considering Tesla has competition coming to the stage quickly. Nissan will sell the electric Leaf and General Motors is ready to bring the hybrid-electric Chevrolet Volt to market next year -- a year ahead of the Model S.
The Nissan Leaf is set to get 100 miles to the charge with just a $25,000 price tag (after tax credits). The Volt will get 40 miles to the charge, but will also have a gas engine, and it will be sold for about $35,000. The Tesla Model S will have a variety of range options from 160 miles to 300 miles per charge, but at double the price of the Leaf, Tesla will likely remain a niche automaker for some time. What's more, Tesla has just 12 dealerships to sell and service its vehicles, compared with more than 1,000 Nissan dealers and thousands of Chevy dealerships in the United States. "I'm struggling to see what Tesla's unique selling point is, to be frank," said MacKenzie. But Tesla owns an undeniable "cool" factor that its competitors would love to have. The ultra-slick Roadster has a range of about 244 miles per charge, according to the company -- the first production electric vehicle to get more than 200 miles on a single charge. And it does zero to 60 miles per hour in just 3.9 seconds -- better than most similarly priced sports cars. With the Model S, Tesla hopes that it can match "cool" with affordability and practicality and make its new investors happy. IPOs make a comeback. But why?